Pottery Mark "H" inside a flower - "Hand painted Japan"
Pottery Mark "H" inside a flower - "Hand painted Japan":- I have a figurine of a dog with a red collar. On the bottom is a stamp that is the letter “H” inside the center of a flower. The stamp is red. It states around the outside of the stamp, “HAND PAINTED JAPAN”. There is lettering on the dog’s back as well, but some of it is missing and it is not legible. How can I locate information on this piece? I’ve had it for some time. Peter (admin) says about:- Pottery Mark "H" inside a flower - "Hand painted Japan"
Pottery Mark "H", "Hand painted Japan", Tentative date: 1920-40. Mark attributable the Hotta Yu Shoten & Co. Pottery in operation from 1920 to 1947. The logo is in fact a depiction of cherry blossom. The shop selling the wares was the Hotta Yu Co. The use of the word "Shoten" means "shop which sells wares fired from its own kilns". The pottery mark is likely to be from the 1920-30's. The use of NIPPON was generally discontinued after 1921. If the backstamp were to say "Hand Painted, Made in Occupied Japan", the date would be 1945-52. This firm made an array of tableware and kitchen ware, as well as very cute animals. Just about every design I have seen from this company is a peach. Very nice design values, yet I suspect the wares were not expensive at the time and were possibly considered 'cheap' mass production even though they flagged up 'hand painted'. Fact is, all ceramic of this type would be hand-painted unless it calls for transfer printing on certain bits. They certainly are not generally expensive to purchase now and I have seen wares ranging from $10 to $200. If I were to be starting a collection, this might be where I would start. Nearly antiques, very nice design and sculptural values, a little piece of world history, and cheap as chips. Comments for Pottery Mark "H" inside a flower - "Hand painted Japan"
SHE WENT TO THE MOVIES DURING WORLD WAR 2. IT IS ALL IN BLACK LETTERING. JUST WANTED TO KNOW IF THEY ARE WORTH ANYTHING, THEY ARE ALL IN EXCELLENT CONDITION. I too have a an item with the H mark on it in black. It is a sugar and creamer with a small tray to set them on. The flowers on the tray and others are blue. I appears to be very old but can't find info on it. I have a nice orange Dragonware tea set (21 piece) with H in a flower and the word Japan under the flower. color of stamp also orange. Kinda lost the string of comments. Sorry. I have a tea set with the same mark only instead of an H, I have a T. Would love to know the maker. I also have a tea set with large orange black and red flowers, the saucers in the shape of card suite i.e. club, diamond, heart and spade with the trademark stamp of a cherry blossom flower with a capital T in the centre hand painted Japan. Would love to know the maker and/or history. Thank you for any info provided. Sugar and Creamer marked "H"
I have a porcelain sugar and creamer, each in the shape of a duck. They are marked with the "H" inside the cherry blossom and the word "Japan" below. Are you familiar with this design? I could send a picture, if that's possible. My stamp is black same H in flower mark .it's hand painted , some kind of hanger , has two holes on each side , has age lines. And four bird drawings in side bowl with various small flowers . T inside cherry blossom - maker? Does anyone know anything about the maker of the mark of the T inside the cherry blossom? Researching through my antique oriental books, I found the symbol of the flower with an "H" and words "Hand Painted" , "Japan". The flower is actually a plum blossom. It is classified as a post-Nippon Era mark. This means it was made sometime after 1921...when the United States no longer accepted Nippon through U.S. Customs...and the word was changed to "Japan". I too have the flower but with a "T" in the center. Who is the maker and year of make? Thanks! I have a dish stamped with and orange/rust color cherry blossom and above it I believe it says hand painted. 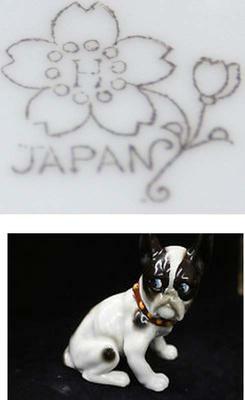 Next to it, in the pottery/porcelain is deboss stamped made in Japan. The dish is a beautiful art deco/art nouveau female figure ring or trinket dish. I have only seen one other on Pinterest. It had a link to eBay but the link was dead. My item with the "H" in the flower is a swan, handpainted and numbered. I am guessing that it is a candy dish. Any thoughts?